The Golden Statue of the Virgin Mary sits high atop the Mariensaeule in the Marienplatz, which is located in the city of Munich in the Bavarian region of Germany. This statue is glowing gold as it is lit up at dusk. This golden statue of the Virgin Mary overlooks the activities in the Marienplatz, which is located in the City of Muenchen (Munich), located in the Bavarian region of Germany. The Marienplatz translates to Mary's Square in English and is a famous and central square in Munich. The Mariensaeule is a column in the Marienplatz, which translates to mean Mary's Column in English. in the Marienplatz, City of Munich, Germany. This particular column with the Virgin Mary on the top was built in 1638 to mark the end of the Thirty Years' War and the Swedish occupation of Germany. 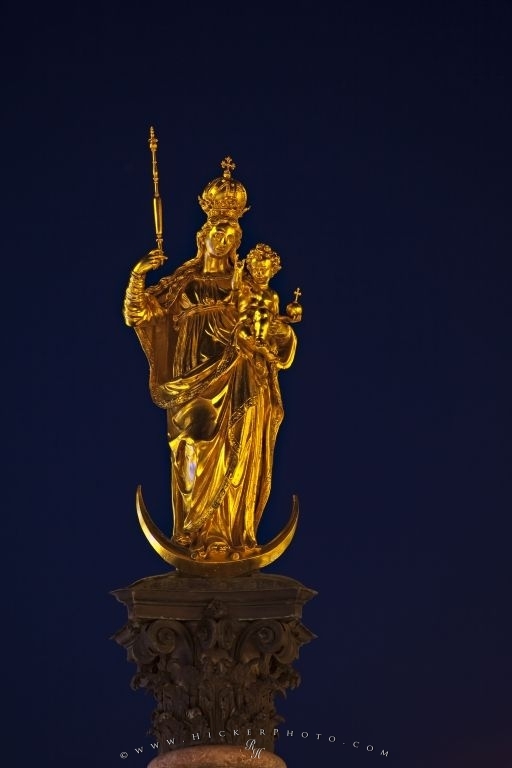 The Virgin Mary is standing on a crescent moon, which represents the Queen of Heaven, a title often given to the Virgin Mary by Catholics, Anglican and Lutheran churches among others. This statue was created in 1590 so it is older than the column on which it stands. It was originally located in the Frauenkirche, or Cathedral of Our Dear Lady in Munich. It was moved to this column when it was completed. Golden statue of the Virgin Mary atop the Mariensaeule in the Marienplatz at dusk in the City of Muenchen (Munich), Bavaria, Germany, Europe. I photographed this photo with the digital SLR camera model Canon EOS 5D Mark II, aperture of f/8.0, exposure time of 4/1 sec. on ISO 100, as always I used a original Canon Lens, the focus lenght for this picture was 400mm.